Strikes are essential for workers, which is why Cynthia Nixon pushed to legalize them for New York public-sector workers. That stance threatened bosses' interests — which is why Andrew Cuomo, Bill de Blasio, and even some union leaders pushed to keep them illegal. 2018 has seen a long-overdue resurgence in strike activity. Most spectacularly, public school teachers in the deep-red states of West Virginia, Oklahoma, Kentucky, and Arizona struck despite laws prohibiting public-worker strikes. So strong was their public support that none of the Republican-dominated governments in those states dared to enforce the anti-strike laws. Instead of complaining about the teachers’ disruptive tactics, parents joined their calls for more public funding and higher teacher salaries. For the first time in decades, the Republicans’ low-tax and anti-public-education policies faced a serious challenge in the red-state heartland. So why did two leading New York Democrats effectively come out and say that teachers and other public workers who strike should be fired and fined? The Democrats are the pro-labor party, right? Not judging from the pronouncements of Governor Andrew Cuomo or Mayor Bill de Blasio. Both came out in support of the New York Taylor Law’s draconian strike ban, which makes red-state anti-strike laws look like pieces of fluff. Strikers can be fired and fined for peacefully refusing to work, but their leaders can be jailed, and their unions fined millions of dollars. Officials have no discretion to grant amnesty in a strike settlement. Under the Taylor Law, the red-state teachers would have been punished notwithstanding the justice of their cause or the extent of their public support. So repressive is the law that it has been condemned by the Committee on Freedom of Association of the International Labor Organization, a tripartite body that includes employer representatives. The next time a Republican governor works up the nerve to enforce anti-strike laws against public workers, they’ll have the satisfaction of piggybacking on those Democratic friends of labor, Cuomo and de Blasio. What provoked Cuomo and de Blasio to close ranks and launch a simultaneous attack on workers’ rights? Gubernatorial candidate Cynthia Nixon had the audacity to include in her platform a plank endorsing public workers’ right to strike. No wonder Cuomo and de Blasio struck back: Like Bernie Sanders, Nixon threatened the grip of Wall Street-backed politicians on what was once the party of working people. The recent teacher strikes underscore another, equally vital function of the strike: political democracy. 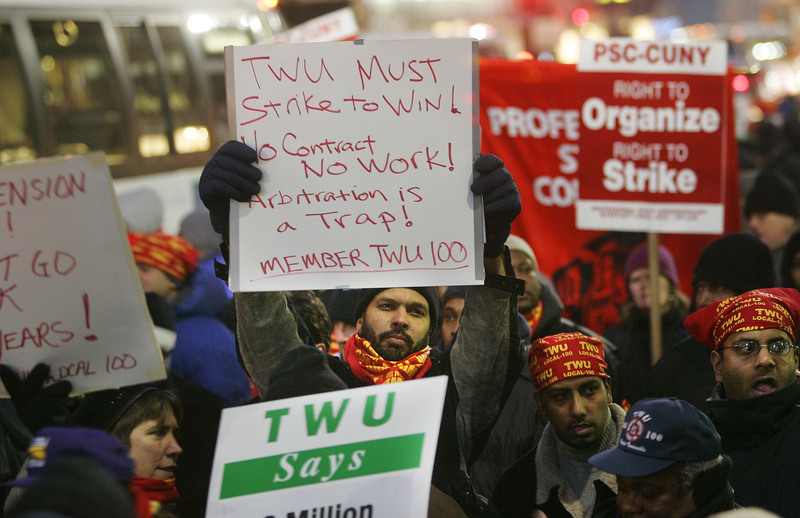 It is no accident that strikers often serve as midwives of democracy. Examples include Poland in the 1970s, where shipyard strikers brought down the dictatorship, and South Africa in the 1970s and 1980s, where strikers were central to the defeat of apartheid. Even in relatively democratic countries like the United States, workers often find it necessary to withhold their labor in order to offset the disproportionate power of wealthy interests and racial elites. During the 1930s, for example, it took mass strikes to overcome judicial resistance to progressive economic regulation. Today, workers confront a political system that has been warped by voter suppression, gerrymandering, and the judicial protection of corporate political expenditures as “freedom of speech.” With corporate lackeys holding a majority of seats on the Supreme Court, workers may soon need strikes to clear the way for progressive legislation just as they did in the 1930s. But if the right to strike is a no-brainer, then how did Cuomo and de Blasio justify attacking it? “The premise of the Taylor Law,” said Cuomo, “is you would have chaos if certain services were not provided,” namely police, firefighters, and prison guards. If that’s the premise, then why not endorse Nixon’s proposal as to teachers and most public workers, and propose exceptions for truly essential services? That’s the approach of international law, and that’s what Nixon clarified she supports. But Cuomo couldn’t explain why teachers and other nonessential personnel should be denied this basic human right. As for de Blasio, he claimed that the Taylor Law accomplishes “an important public purpose” and that “there are lots of ways for workers’ rights to be acknowledged and their voices to be heard.” What public purpose? Forcing workers to accept inadequate wages and unsafe conditions? What ways to be heard? Groveling to politicians for a raise in exchange for votes? Tough talk. Roger Toussaint, the TWU Local 100 president who led a subway strike in 2005 and was jailed for it, once tagged Samuelsen a “lapdog” for Cuomo. But “attack dog” might be more accurate in this case. Presented with a rare opportunity to trumpet workers’ most fundamental right in the glare of media attention, Samuelsen chose instead to drive a cultural wedge between traditionally minded workers and nonconformists, many of whom toil as baristas, restaurant servers, and tech workers — constituencies that are fueling the anti-Trump resistance and pushing the Democratic Party to break with Wall Street. Samuelsen’s descent to Cuomo attack dog is inexplicable except as a response to the crushing pressures generated by the Taylor Law. He stands out from most other public-sector labor leaders not for sucking up to establishment politicians, but for minimizing it. Just two years ago, Samuelsen was one of the few major labor leaders who had the guts to endorse Bernie Sanders over Wall Street’s choice, Hillary Clinton. And when he was elected president of the New York local, it was on a promise to be more effective at mobilization and confrontation than Toussaint. Once on the job, however, he and his slate had to confront the devastating results of the strike ban. In addition to jailing Toussaint and penalizing strikers two days’ pay for each day on strike, a court had fined the union millions of dollars and stripped away its right to collect dues through payroll deductions. No wonder Samuelsen quietly redirected the union’s strategy away from striking and toward less confrontational mobilizations and political deal-making. Red-state teachers have shown the way, exercising their constitutional and human right to strike in defiance of “law.” Will Democrats and labor leaders celebrate their example, or will they follow Cuomo, de Blasio, and the Republicans down the path of suppression? Republished from The Clarion .